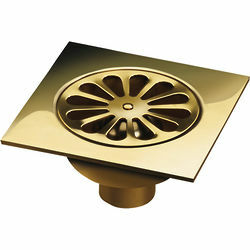 VDB Shower Drains > Shower Drain 150x150mm (Polished Brass). Van Den Berg shower drain in polished brass. Removable protective cover so no cement residue is left on the beautiful surface. Suitable for shower rooms, swimming pools, renovations, schools, hospitals and toilets. Connection: 50mm or 40mm (adaptor included). High quality plumbing parts, made in the Netherlands. 5 Year guarantee: Van Den Berg guarantee their Shower Drains for 5 years. Van Den Berg Shower Drains are suitable for wet rooms, shower enclosures, bathrooms, cloakrooms and swimming pools. Manufactured to the highest standards, Van Den Berg offers a comprehensive range of solid stainless steel or ABS plastic drains, some with a choice of grate styles, ABS plastic rectangular drains with stainless steel grates. Van Den Berg aim is simple, to provide you with the shower drain you are looking for, at a price that meets your budget. Taps4Less are now the exclusive supplier of Van Den Berg plumbing products in the UK. Van Den Berg are one of the leading manufactures of domestic and commercial shower drains in Europe. They have been manufacturing high quality ABS plastic, aluminium and stainless steel drains since 1974. At the beginning of 2000 a shift took place in the field of water drains, design drain products were developed, such as tile drains, shower channels and design gratings. These shower drains are built in the Netherlands to the highest of European standards.